Fund-A-Need functions when teachers find problems in their school, and take dedicated action to solve those problems. 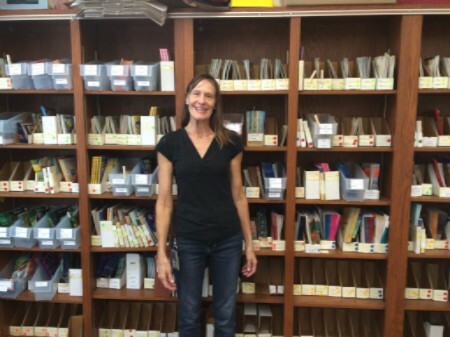 Calvert Elementary teacher, Rhea Hochstein, found a place where she could make a difference in her school’s book room. Before the Foundation, Calvert’s book room had many incomplete sets, outdated or inappropriate titles, or missing pages. None of the books were being replaced, the quality and selection was lacking, and there were only a few non-fiction books. Something needed to be done—PTSO helped replace many missing books, but didn’t add any new titles. Calvert’s PTSO put together a few lists of desired titles, created by using the District Reading Committee’s official recommendations. Rhea went through these catalogs and put through multiple proposals for different sets of books, which were all promptly funded by anonymous donors! Now, there are enough books for all K-3 students. Additionally, the variety of books greatly increased. There are more accurate non-fiction books, new fiction books, and Rhea says that the kids absolutely love the variety. Now, there’s enough for a whole group of students to have their own books (without sharing), which used to be impossible! To Rhea Hochstein, the impact on children is a compelling reason to do Fund-A-Needs. She wishes that she could reach out to donors, saying, “Many of these donors are anonymous. I wish there was some way to make them know the deep, deep impact they have.” By granting resources that students wouldn’t otherwise have, donors inspire them to learn, and help the teachers provide extra activities for their classroom.